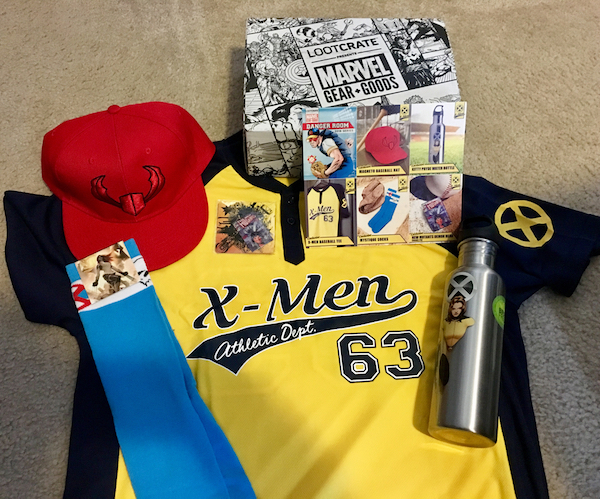 Loot Crate’s Marvel Gear and Goods theme for April was the X-Men. In each of the Marvel Gear and Goods crate you will get a bunch cool items that are things that you can showcase in your house, wear and even drink out of. In each Gear and Goods create you will find around 4-6 officially licensed and exclusive items in every crate. The cost is around $36, but each crate has items with at least $75 in value. I really loved the X-Men baseball tee. It is great to wear out during the spring and summer months. The yellow and blue color theme for the baseball jersey takes me back to the 1990’s X-Men animated series where the team’s colors were yellow and blue. The Magneto hat is a snapback. While I prefer the FlexFit style of hat this particular snapback hat feels comfortable. It has a great drawing of Magento underneath the brim of the hat. If you like what you see make sure you sign up for the Marvel Gear and Goods crate subscription. There are different themed crates as well. There is a Loot Anime, Loot Gaming, Loot Pets, Firefly, and LVLUp. They even have limited edition Star Wars and Call of Duty crates. You can pick out the best one that fits your style and your budget. Go to www.lootcrate.com for more info on each one and to start your subscription today! Print article This entry was posted by Art Eddy III on April 25, 2018 at 3:51 pm, and is filed under Entertainment. Follow any responses to this post through RSS 2.0. Both comments and pings are currently closed.